Picture Dorsey Truitt. Used by permission only. And actually, The Ocean Bowl Skate Park at Ocean City, MD is the oldest operating municipal skate park in the United States. Following the rise in popularity of skateboarding in the 1970s, the Ocean City Council banned skateboarding on the streets within City limits. This prompted many skaters and their parents to attend the next Council meeting to ask that a space be provided for them to pursue their sport. By the first week of June, 1976, the park opened. At that time, the facility consisted of a four foot deep asphalt bowl which proved so successful that a larger bowl was quickly added. In 1984 this “big bowl” was structurally weakened by successive tropical storms and was removed the following year. It was succeeded by an eleven foot high, twenty eight foot wide metal-surfaced halfpipe which served not only to replace the lost bowl, but also to respond to the changing demands of skateboarding and the huge popularity of vertical ramps at the time. The ramp and the small bowl stood for another ten years when finally, in 1997, due to time, wear and the current needs of skaters, the park was again in need of renovations. After long hours of planning and many meetings, the City Council together with a Skate Park Committee composed of local skaters, business people, politicians and parents, came up with the resources to build the park that exists today. The old bowl and ramp were torn down in the Fall of 1997 and the new park opened in July of 1998. And guess what, the Ocean Park at Ocean City MD is organizing next July 20th a contest called Commontion Down The Ocean. Pedro Barros during the 2010 Dew Tour Championships in Las Vegas. The Commotion Down the Ocean is a kind of skateboard demo designed to raise awareness and garner assistance for people with cancer through the Grind for Life organization. 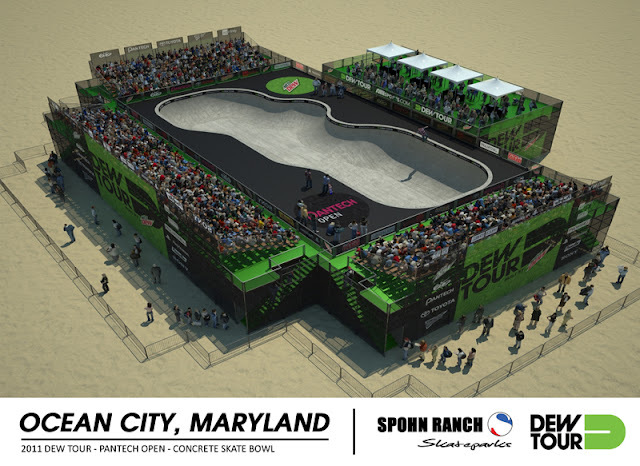 The event is also paired with the launch of the Dew Tour. The one day bowl event will consist of a local contest, skateboarding demos, a vendor’s village offering food, music and amenities and finally autograph sessions with the Dew Tour pros; including Bucky Lasek, Adam Taylor, Pierre Luc-Gagnon and Andy MacDonald, who also sits on the Grind for Life's Board of Directors. There is a $20 entry fee to participate in the skate competition and those who sign up will be divided into classes. As of press time there are seven classes, including ones for women and long boarders. Those interested in participating may register for their division of choice at the Ocean Bowl starting at 10 a.m. on the day of the event. The competition is expected to get underway by 2 p.m. and continue until 5:30 p.m.
An awards ceremony will follow. 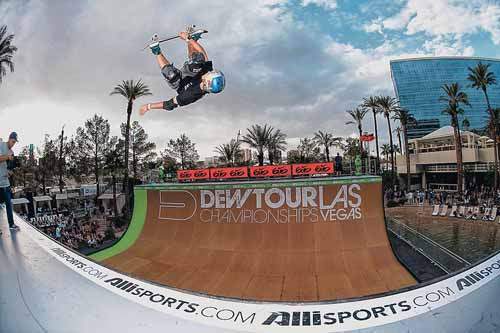 This year, the Dew Tour is adding concrete to its routine. It's about time bowl riding is recognized.